A Universal Remote that lets you Control your Home-Entertainment Devices—even when they’re hidden!! Get easy, intuitive control over just about any home theater system with Logitech’s Harmony 900. This universal remote combines both IR (infrared) and RF (radio frequency) technology, so you can operate your components even if they’re hidden out of sight. 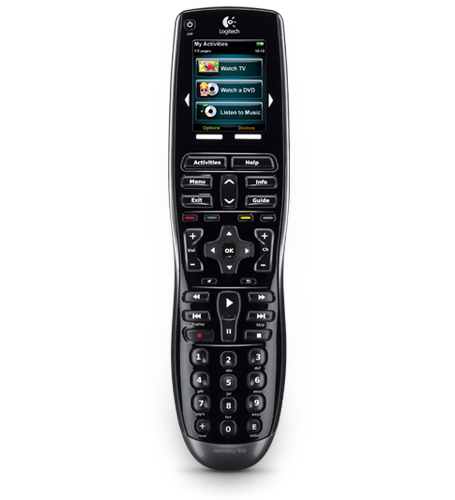 The remote’s sharp-looking color touchscreen clearly displays common activities, like “watch TV” or “listen to music.” When you select an activity, the remote instantly evaluates your system, conveniently turns on or off the appropriate components, and even selects the proper settings for you. 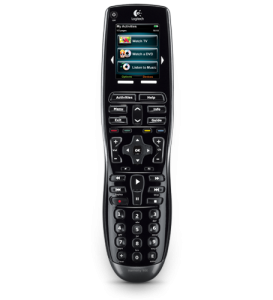 The Harmony 900 emits powerful RF signals for operating components you’ve placed out of sight. Just plug the included RF extender into a power outlet and stow it behind your hidden components. Then connect the two tiny IR “miniblasters” to the extender, and position them in front of the components. The extender picks up the RF signals sent by the remote and converts them back into IR signals which your devices can understand. Previous Previous post: DISH Network Tailgater is Here! Next Next post: Compunet is Your Local DISH Network Authorized Retailer!